The second button can be used to remotely switch a deck light. Full Installation and Operating Instructions. 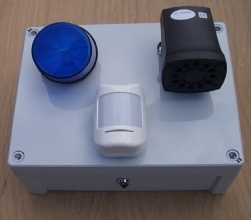 The sealed alarm control box contains a re-chargeable lead acid battery, a trickle charger (working from the boat’s battery), the alarm PCB, the dialler PCB and a terminal board used to connect the alarm to the sensors, siren etc. PANIC ALARM - press both fob buttons together. Don’t wait until you have suffered a break in or theft. This alarm will sound its loud 120 dB siren the instant a thief forces entry AND the dialler will send a text message to up to 3 different mobile phones. For even more effect the boat’s horn can be sounded together with the siren. A flashing strobe light identifies which boat alarm is sounding. The alarm can use either a PIR detector or door/window contacts or both to detect intruders. Expensive outboards can be protected with a wire loop. This is some cases can be connected through an unused pin on the outboard’s electrics. Operation of the battery isolator switch will also trigger the alarm. The internal re-chargeable battery ensures that both the siren and the dialler remain working should a thief disconnect the boat’s battery.